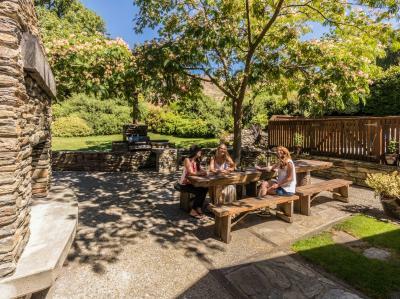 Lock in a great price for Wanaka Homestead Lodge & Cottages – rated 9.6 by recent guests! Nice and peaceful lodges and very helpful and attentive staff. A good selection at breakfast and a relaxed atmosphere is a nice touch. Located within easy walking distance of Wanaka and the beach these lodges are worth a visit. It was a shame we were only stopping one night. Comfortable bed, nice manager, pretty, near Lake Wanaka and that Wanaka Tree, good continental breakfast plus eggs. WOW WOW WOW WOW. This accomodation was absolutely sensational. Word's truly can't describe how beautiful and majestic this homestay really is. Fantastic hosts, surroundings and the bedroom, Oh my gosh it was too die for. The breakfast was world class everything was perfect and catered for to my/our liking. Nothing was too much hassle or stress. We'd happily stay here again in a flash. I'm going to keep this review short and sweet. All I really want too say is. If you find youself in wanaka you have to stay here. Its worth every single cent you pay. The location is excellent. We stayed at the master bedroom which was beautiful and really comfortable as the rest of the facilities. Beautiful, pleasant, and peaceful accommodations. Bed was very comfortable and bathroom products lovely. The grounds are inviting and the breakfast is wonderful. Karen is a fabulous hostess. She really makes you feel at home. A very impressive cottage right next to the Wanamaker tree. It just got everything you need, perfect for a big family. What a fantastic place to stay. We felt like we were a party of the family (but with space and privacy when we wanted it). Breakfast ticked all the boxes and we honestly could not have had more accommodating hosts. The room and bed were spacious and comfy. The homestead feel with a fire every evening was just what we wanted. Thanks for everything. Wanaka Homestead Lodge & Cottages This rating is a reflection of how the property compares to the industry standard when it comes to price, facilities and services available. It's based on a self-evaluation by the property. Use this rating to help choose your stay! Located just 650 feet from the shores of Lake Wanaka, guests at Wanaka Homestead Lodge & Cottages have a choice of B&B accommodations or self-catering cottages, all with free WiFi. Providing easy access to the surrounding ski fields, Wanaka Homestead is only 12 mi from the ski areas of Cardrona, Treble Cone and Snow Farm. The 18-hole Wanaka Golf Course is only 0.6 mi from the lodge. Each room in the Lodge has an private bathroom, heating and satellite TV. All cottages feature generous living areas, well equipped kitchens and a TV with DVD player. Facilities include a guest laundry, drying room, ski storage and free off-street parking. Guests also have access to a small DVD library, barbecue facilities and a large outdoor hot tub. Continental breakfast is available for guests staying in the lodge. The tour desk can organize local activities including fishing, lake cruises, jet boating, yacht charters and kite surfing. This property also has one of the top-rated locations in Wanaka! Guests are happier about it compared to other properties in the area. This property is also rated for the best value in Wanaka! Guests are getting more for their money when compared to other properties in this city. When would you like to stay at Wanaka Homestead Lodge & Cottages? Located in the bed and breakfast lodge, this room offers a TV with satellite channels. There is an private bathroom. Children under the age of 16 years cannot be accommodated in this room. Located 492 feet from the lake, this cottage features 2 bathrooms and underfloor heating. Located 492 feet from the lake, this family cottage includes underfloor heating, a TV, and a fully equipped kitchen. Located in the bed and breakfast lodge, this smaller room features an private bathroom, TV with satellite channels, a fan and a heater. Please not that this room does not face the garden. House Rules Wanaka Homestead Lodge & Cottages takes special requests – add in the next step! Wanaka Homestead Lodge &amp; Cottages accepts these cards and reserves the right to temporarily hold an amount prior to arrival. Wanaka Homestead Lodge & Cottages accepts these cards and reserves the right to temporarily hold an amount prior to arrival. Please note that it is not possible to check in or check out on Christmas Day. Please note that children under 16 years of age cannot be accommodated in the King Room and are not permitted in the lodge area. Children are welcome in the Two-Bedroom Cottage and Three-Bedroom Cottage. Please inform Wanaka Homestead Lodge & Cottages of your expected arrival time in advance. You can use the Special Requests box when booking, or contact the property directly using the contact details in your confirmation. Staff were a bit abrupt and unfriendly when we arrived 10mins before check in started. Had to wait outside with 3 other groups who arrived early until we could check in after 3pm. Host was wonderful, full of good tips, very energetic, personable and bubbly. Beautiful house and premises, a home away from home in a very European style. The manager of the place was most welcoming and very friendly and forthcoming! Really cozy place and perfect location, close to everything. Superfriendly staff. Beautiful backyard with bbq and jacuzzi. Fell in love with this place as soon as we got there. Everything was just perfect. Lovely staff and excellent bacon and egg breakfast. Air conditioning in the rooms would be good in summer - obviously no problem in winter. The setting, the host, the bed... it was all lovely :) 'That Wanaka Tree' was so close! The bathroom facilities were a bit awkward - i.e both upstairs bedrooms had to share a downstairs bathroom. Also the bathroom was not very inviting. Great checking in process with Karen - a delightful lady. Very comfortable beds indeed and a good choice of bedrooms. Location, friendly atmosphere, nice breakfast around a big table with other guests.